Ok so you know how my love for raspberry drinks and desserts are like crazy right? 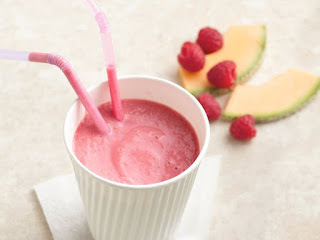 Well this recipe is for "Melon-Raspberry Smoothies". Those are 2 of my favorite fruits! This smoothie is LOADED with Vitamin's A & C, and also Calcium and Iron! It tastes so yummy and I have been loving drinking it every morning. Cool down on the hottest of days with this fresh and fruity drink! In blender, place ingredients. Cover; blend on high speed 20 to 30 seconds or until smooth. Blueberries can be substituted for the raspberries. Mango can be substituted for the cantaloupe or honeydew. When purchasing fresh berries, make sure to look the package over carefully. The fruit on the bottom shouldn’t be bruised, and the fruit should smell sweet, not musty. Store berries unwashed and loosely covered in the refrigerator.